special execution pump for high pressure services (more than 300 barG) powered by diesel engine (f.i. 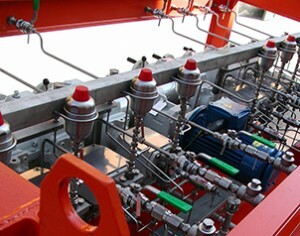 mobile pump for hydrostatic tests). OMG is able to manufacture the entire range of products with special materials for pumps’ wetted parts; all plastics, all steels, titanium, nickel alloys ( f.i. Alloy 20, Hastelloy C276) etc. are in stock and daily managed, allowing short delivery time. calibration pots to be installed on process suction side to detect pump capacity (available in different volumes and materials). These a.m. special products as well as these loose supplied accessories are always made in-house.